1. In container with lid, whisk together Pear juice, soy sauce, vinegar, oil, chili sauce and ginger; add shrimp, toss to coat, cover and refrigerate 1-2 hours, stirring occasionally. 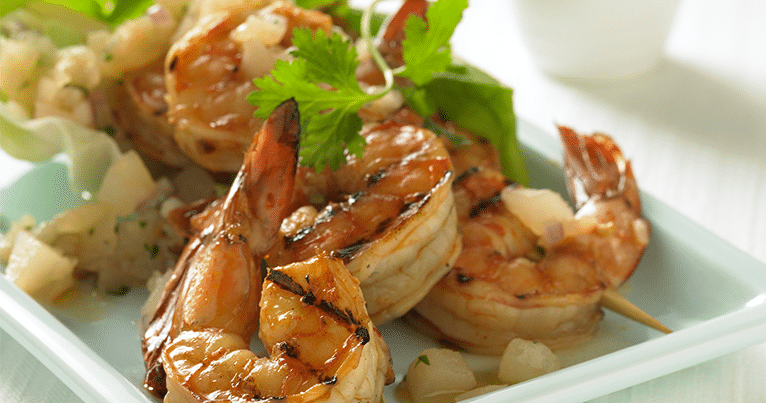 Before cooking, remove shrimp from marinade and drain. 2. Weave shrimp evenly onto skewers, 3 shrimp per skewer. 3. To Prepare: Grill 2 skewers per serving to order over medium-high heat. 4. To Serve: for each serving, place lettuce leaf on plate and mound 1/4 cup Pear Relish* over leaf. Top with 2 shrimp skewers and drizzle with 2 teaspoons Sesame oil. Garnish with fresh cilantro sprig. Pear Relish: In a bowl, combine all ingredients; toss to mix well; cover and refrigerate a least 2 hours before using as directed. Mixture may be processed slightly for smoother texture to serve as dipping sauce.